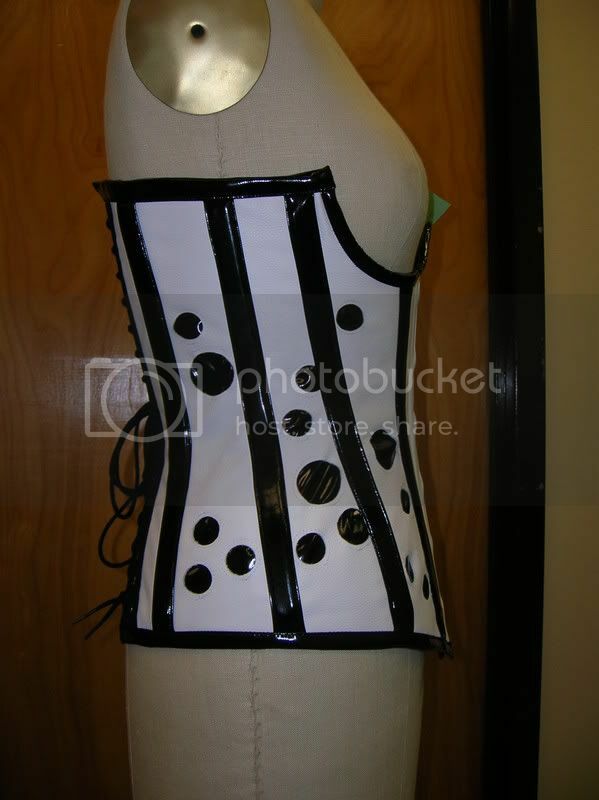 Here is a corset I just finished for school. I'm so in love with this one, partially because its the first thing Ive made for school that will actually fit me. I made the laces super wide in the back and used the smallest judy the school has so it will go small enough. It's white leather and black PVC. The circles are actually cut outs in the leather so you can see the PVC behind. 1/2" flat steel boning all around with 1/4" flat steel on either side of the eyelets. WOW, it's so pretty, but I would perfer it without the circles, though it would be very "clean" that way. perfect color combo and i love the cut out idea...fantastic! I love this so much. It is very much something I would wear! Fiber art is where the cool kids yarn. wow. Usually I hate the look of PVC corsets, but this one just takes my breath away! I absolutely love the circles and perfectness of the lines and the underbust! it's so gorgoeuos! i bet you'll stand out going clubbing with that. it looks really prefessional! Thanks everyone for the positive feedback! As for the person who said they would like it without the circles, I was thinking that too, I love it but I want to make another thats just all white with the rest of the leather I have.